Lachenalia lutea is a heavily sweet-scented indigenous hyacinth with pale to bright yellow flowers. It consists of a single white fleshy bulb about 15-20 mm in diameter, with fine white adventitious roots, and two strap-like lanceolate leaves 90-140 mm long. Unlike certain Lachenalia species, L. lutea does not possess any bumps or pustules on the upper surface of the leaf. The leaf is leathery and usually bright green, occasionally covered with dark green spots on its upper surface, and occasionally with dark brownish purple spots underneath. The leaves will start to emerge a few weeks after the first rains in autumn, and wither naturally in late spring/early summer. The inflorescence, in the form of a spike, can grow up to about 110 mm tall and, depending on the form, appears from early to late spring. The flower colour is typically bright to pale yellow, sometimes with a greenish tinge, and is fairly consistent throughout its distribution range. The flowers are sessile (without a stalk). The fruit are small capsules that ripen a month or two after flowering to release small shiny black seeds. L. lutea is generally smaller in stature than some of the other more robust yellow-flowering species like L. orchioides, L. marginata and L. arbuthnotiae. This species is not currently recognized as being threatened; however, it has lost more than 60% of its habitat in the last 70 years. Certain local forms of this species may be extinct, and many only remain in very small and fragmented populations on roadsides and unploughed corners of farmland. 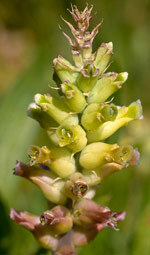 The genus Lachenalia is generally restricted to the winter-rainfall parts of South Africa and Namibia. L. lutea is found only in the Fynbos Biome of the south Western Cape, in roughly a north-south band ranging from the Bot River and Strand in the south to Tulbagh to the north and west. 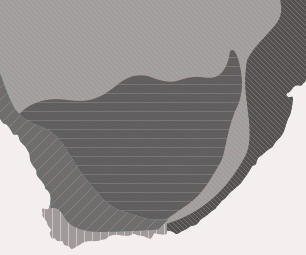 It prefers heavy clay soils in the renosterveld, ranging in habitat from seasonally moist flats to hill slopes. Its specific name lutea = yellow refers to the consistently bright yellow colour of its flowers. Despite the fact that this is one of the commonest of the Western Cape lachenalias, surprisingly it was overlooked for a long time by botanists and was only formally described as a species by Graham D. Duncan, a botanical horticulturist at Kirstenbosch Botanical Garden, in 2006. 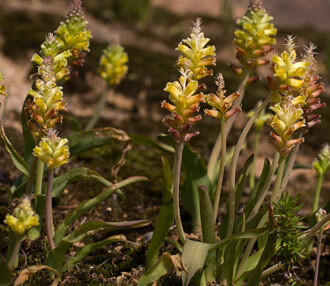 Like all other Lachenalia species, L. lutea is a typical winter-growing bulb that is summer-deciduous, i.e. it becomes completely dormant during the hot dry summer months in the Mediterranean-type climate of the Western Cape. L. lutea is sweetly scented and is probably pollinated by bees, amongst other agents. It responds particularly well to fires and can be seen flowering en masse after a summer bush fire. Lachenalias are often regarded as one of the most rewarding groups of Cape winter-growing bulbs to cultivate. One of their virtues is their vast array of flower colours appearing in practically every colour of the rainbow. L. lutea is very easy to grow and a rewarding species to grow as a pot subject. The soil medium should be fairly well-drained and consist of about half coarse washed sand and half finely sieved compost. This should be used to fill the lower two-thirds of the pot. The upper third should be pure sand with no loam or compost into which the bulbs are planted. This layer stays relatively dry, preventing the bulbs from rotting if they should get too wet, while the roots can safely penetrate the richer moister organic medium below. They should be kept in full sun and will grow very happily outside during the winter months, providing the temperature does not drop below freezing. In summer the bulbs should be kept dry, preferably in a cool position. One can either lift the bulbs and store them in paper bags or store them in their pots. They enjoy being repotted every 2-3 years with fresh soil medium. They are easily propagated by leaf cuttings, which can be removed from the plant by slicing them at the base of the leaf blade. These leaves are then half buried in a very sandy medium and left in a cool place out of direct sunlight. The soil should be kept on the dry side to avoid the leaves rotting, while the humidity can be quite high - humid air and dry soil is the trick. Within a few months, small bulbils will appear along the cut edge at the base of the leaf. Eventually the leaf will wither but the bulbils can be planted like normal bulbs the following season. Flowering will take 1-2 years. They don't have many pests apart from snails and caterpillars (which can be removed by hand) and mealy bug which should be treated with a systemic pesticide. A rust fungus can be problematic and appears as orange blotches on the leaves, often developing where a leaf has been damaged by hail, for example. This is easily preventable (which is preferable) and treatable with common fungicides. Not much fertilising is required for these bulbs, as they are not generally very demanding, but they would respond well to small doses of a dilute, low-nitrogen, liquid fertiliser. Duncan, G.D. & Edwards, T.J. 2006. 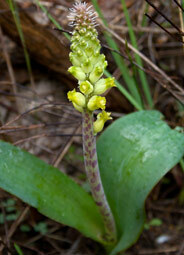 Three new species of Lachenalia from Western and Northern Cape, South Africa. Bothalia 36,2: 147-155. Raimondo, D., Von Staden, L., Foden, W., Victor, J.E., Helme, N.A., Turner, R.C., Kamundi, D.A. & Manyama, P.A. 2009. Red List of South African plants. Strelitzia 25. South African National Biodiversity Institute, Pretoria.